The Sydney to Brisbane coastal drive, dubbed the Legendary Pacific Coast, ranks as one of Australia’s top road trips. With plenty to see between these two cities, it’s easy to see why people wish to take their time driving the 900 or so kilometres. To help make planning your itinerary for this fun Australian road trip easier we’ve done the research for you and sourced 10 holiday parks that have a minimum Tripadvisor rating of 3 1/2 stars. With all of our recommended parks we’ve included accommodation options, such as beach cabins or powered or non-powered campsites, and activities to do while you’re there. Happy road tripping! About 17 km from Sydney’s central business district, Sydney Lakeside Holiday Park offers campers a range of facilities from villas and cabins, to ensuites and powered/non-powered sites. Between the free Wi-Fi, playground and waterpark for kids and a video/games area, you might stay longer than a day. Save your money for the rest of the trip by taking advantage of the camp kitchens or BBQ pavilions. Before heading out on your road trip (unless you’re from Sydney), take a day to enjoy a few sights and get a good night’s rest. Why not take in a guided one-hour tour of the famous Sydney Opera House where you will learn about the history of this iconic building, taking in every aspect of this amazing engineering feat. Tours cost $37/adult, $20/child and $95/family. Book online and save 10 percent on your tickets! Tip: If you have the funds, take a backstage tour. It’s well worth it! This two-hour tour provides you full access to the ins and outs of behind the scenes at the Opera House. It culminates with breakfast in the Green Room. BIG4 Valley Vineyards Tourist Park, located in the town of Cessnock, offers a good location to be able to easily head out to partake in all the valley offers, from wineries and restaurants, to cheese factories and chocolate shops. This family caravan park features self-contained villas, cabins and cottages as well as powered and non-powered caravan and tent sites. So, depending on your method of transport, you should be able to find accommodation here to suit your needs and budget. With more than 140 wineries and 60-plus restaurants, Hunter Valley is a great stop along the Pacific Coast to stay a few days and enjoy sampling some of the best Australian wine and gourmet food. And, if you brought the family along, there are options for them, too, with playgrounds, mini golf and even hot air balloon rides. Located just a little less than three hours from Sydney, you could head out from Sydney and be able to spend your first afternoon exploring the area and taking the beautiful Broke Mountains surrounding the valley. If you’re without the kids, it might be fun to take a wine tour and be able to sample the wine without the worry. There are lots of options from private tours to larger group tours. Located directly on the water, Halifax Holiday Park is just a 15-minute walk to Nelson Bay. Equipped with villas, cabins and powered sites for tents and caravans, this beachfront holiday park provides guests with direct access to Shoal Bay Beach, BBQ and picnic areas and a playground as well as tour booking services and children’s activities during school holidays. After spending a few days indulging on excellent wine and food, head back to the coast and visit the beautiful town of Nelson Bay. Two hours from Hunter Valley, Nelson Bay sits on the southern coast of Port Stephens, part of the New South Wales region. One of the best reasons to visit this area during an Australian road trip is to watch the dolphins that gather in the bay area almost all year round. An experience to remember for sure, a great way to get up close up to those gorgeous creatures is through a tour, with many tours giving people the option to get in the water with the dolphins! Melaleuca Caravan Park, located five minutes from Port Macquarie beaches and 500 km to Hastings River for fishing and boating, provides visitors with accommodations like those of the other holiday parks, ranging from two-bedroom cabins down to powered caravan sites. The facilities include a playground, family/games room and a pool with a waterslide. Meals can be prepared in the camp kitchen or the BBQ areas. Approximately three hours north of Nelson Bay will place you in the town of Port Macquarie. Between the water features – Hastings Rivers, Pacific Ocean, plus creeks, canals and bays – beautiful beaches and much more, Port Macquarie easily ranks as a must-see town along the Pacific Coast. Be sure to do the 9 km Coastal Walk from Town Green breakwall to the Lighthouse Beach, a popular walk that includes eight beaches, vantage points to look for dolphins and whales (from May to November) and Tacking Point Lighthouse. Also, take the time to visit the Koala Hospital where you can see koalas fed daily. South West Rocks Tourist Park is situated on a tidal waterway and only a few minutes from center of town and many activities. This family holiday park has two-bedroom villas down to standard cabins in addition to 150 tent and caravan sites (ensuite, waterfront, powered or unpowered). Facilities on site include a pool with deck and wading area, kitchen and electric BBQ areas, playground and supply kiosk. Hailed as one of the most beautiful beaches in Australia, South West Rocks is only a little over an hour from Port Macquarie, but well worth stopping again so quickly. While visiting this small town, you should really take a guided tour of the ruins of Trial Bay Gaol, a prison on the beach that opened in 1886. When you are done, you could wander over Monument Hill to Little Bay picnic area and enjoy lunch and a chance to spy some of the wild kangaroos. Then, if you’re up for it, you could venture along the 10 km hike that starts from Little Bay and ends at the Smoky Cape Lighthouse in the Hat Head National Park. Only a short drive from Coffs Harbour and that famous Big Banana, Emerald Beach Holiday Park has something for everyone – kids activities, free pancake breakfasts (Wednesdays during low season), go karts and surfboard hires, a movie room and more. The family caravan park has self-contained accommodations as well as caravan and camp sites. Coffs Harbour means you’re halfway between Sydney and Brisbane on your Australian road trip, and this coastal area features tons of attractions along with restaurants and national parks. The Calypso Holiday Park is on the riverfront, putting you within walking distance of many of the town’s attractions. 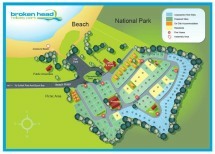 Holiday park facilities include a pool, BBQ area, playground and pontoon. For accommodation there are a variety of cabins and holiday units, as well as caravan and tent sites. About two hours north of Coffs Harbour is Yamba where you’ll find a temperate climate almost any time of year with excellent fishing and prawning. Great beaches, surfing (advanced surfers should check out Angourie point break) and restaurants might be some of the reasons this was named ‘Best Town in Australia’ in recent years. Have dinner at the Pacific Hotel that serves not only good food but also amazing views of the ocean. Check out the Yamba Shores Tavern for lunch and let the kids play on the covered playground. Head to Pippi Beach for soaking up the sun or riding the waves. Broken Head Holiday Park, of course! Located directly on Broken Head Beach, just 7 kilometres south of Byron Bay, this family holiday park features an amenities block and laundry facilities and a range of accommodation options from beach cabins and beach shacks, to powered and non-powered camping sites. The camp kitchen and BBQ area offer stainless steel benches and cooking BBQs where you can grill steaks and sizzle sausages, as well as local seafood goodies. The well-stocked kiosk is on hand for must-have supplies, as well as treats for the kids. Gold Coast Holiday Park sits on 32 acres, giving it room to offer facilities like a big pool that includes a water slide, a smaller pool for toddlers, spa pool and a poolside café for mum and dad to have a drink. This family caravan park provides a free pancake breakfast every Sunday, and a get together every Tuesday evening at the BBQ. Accommodation ranges from tent sites to luxury villas. The Gold Coast’s gorgeous beaches, loads of activities and excellent dining attracts 12 million guests every year. Between the main attractions of the beaches and theme parks and all the “other” options, such as hiking, learning about wildlife and a number of thrill-seeking adventures, it might be hard to narrow down the options. But, luckily, there’s something for everyone, so just pick what works best for your crew, and you can’t go wrong. Brisbane Gateway Resort, just south of Brisbane, has both cabins and camping sites with a variety of sleeping arrangement options however many people you have on your road trip. The holiday park features a tennis court, free Wi-Fi, playground, saltwater pool, lounge, camp kitchen and gas BBQs. A bonus, if you’d like to use public transport rather than your car or if you’re in a caravan, public buses stop at the park. How long do you need for this road trip? It depends on how long you’d like to spend in each area and if you’d want to add in any of the other great towns along the coast on this epic Australian road trip. We suggest at least a week, but if you can make it 10 days or two weeks, then you can soak up each place (and all the great facilities at the holiday parks!) you visit along the way. Any thoughts or ideas to add to this road trip itinerary? Let us know if you did this road trip and found a great place to stop along the way. We love to hear feedback from you! Check out our Facebook page and be sure to let us know your favorite spots along the Pacific Coast! On april we r traveling from brisbane to sydney, we want to stay overnight almost half way to sydney please help us which spot would be better. need beach shoping, dining etc. we also like to travel by bus. please help.